My favorite of this year's Pelikan Special Editions is the reissued M205 Transparent Blue Demonstrator. Apparently 2016 is the year of bringing back old pens out of the Pelikan archive. 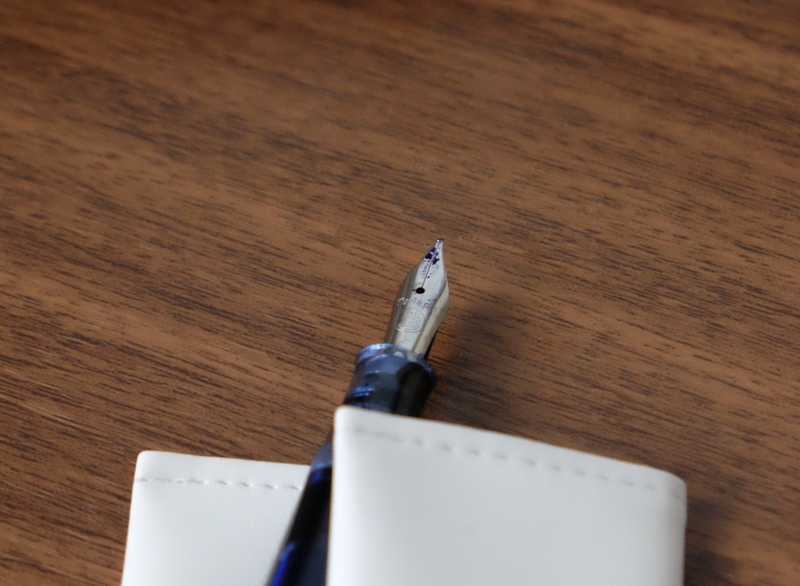 In addition to reissuing their classic M120 fountain pen (a school pen popular in the 1950s and 1960s), Pelikan, to my delight, also decided to reach back not quite so far and resurrect the M205 Transparent Blue Demonstrator, an extremely popular special edition pen that ended its run five years ago before I could pick one up. Once I found out that this pen was coming back, there was no chance I was going to miss it again. 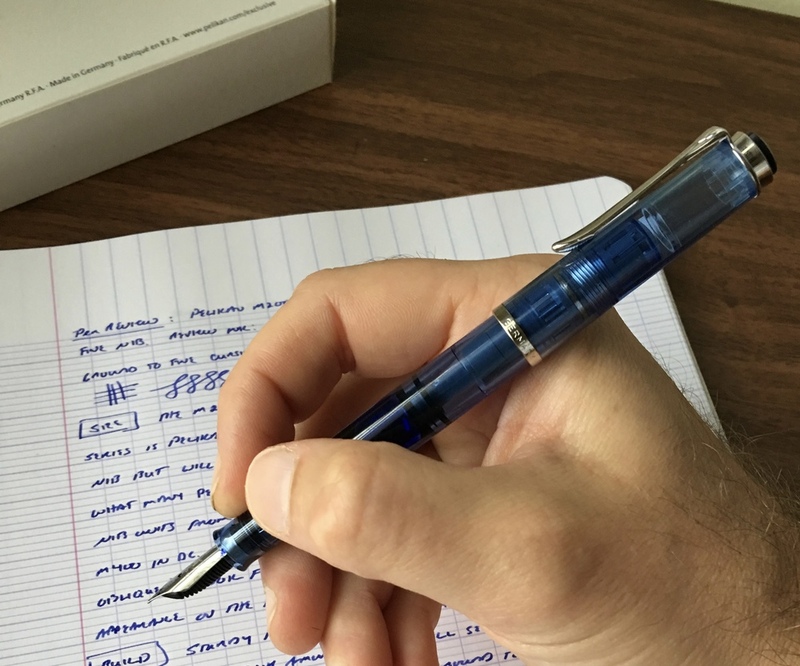 The "new" M205 transparent blue demonstrator is basically the same pen as the original, with one change. Per the Pelikan website, the ring at the top of the cap is now chromium-plated, as opposed to black on the original model. Like the original, it's a piston filler and sports a stainless steel nib. I purchased a fine. I opted for a fine nib on my Pelikan M205, which has been ground to a cursive italic by Dan Smith (The Nibsmith). The nib on my Pelikan M205 was excellent, both out of the box and after being tuned and ground by Dan Smith at the 2016 D.C. Pen Show. Pelikan steel nibs are some of the highest quality steel fountain pen nibs out there, and Pelikan's steel nibs write relatively true to size, as opposed to their gold nibs, which in my experience run extremely wide. I'd characterize the fine nib on my pen as a true western fine, but it definitely had enough tipping material to grind into a smooth cursive italic. The line variation on this fine cursive italic is excellent. The ink used in this writing sample is Iroshizuku Asa-gao. The paper is Clairefontaine French (Seyes) ruled. Otherwise, the M205 is your typical well-constructed Pelikan. The piston mechanism is smooth and reliable. The only potential issue I can spot with this pen's construction is the size: the M205 is relatively small, and the grip section is relatively short. If you tend to hold your pens high up on the section, the threading on this pen may cause you problems. I don't write with a death grip, and I tend to hold my pens fairly close to the nib, so it hasn't been an issue for me. The pen posts nicely, and given its compact size, I need to post to use it comfortably for more than short notes. The Pelikan M205 is a sturdy, versatile little pen that fills a niche in my collection. Part of my love for this pen is nostalgia, since the blue demonstrator version is a reissuance of one of my early "grail" pens that I missed out on the first time around. My main criticism is price: I do think that this pen is a little high at $140, but I don't think it's a bad deal. Pelikan's steel nibs tend to write very well out of the box, and I you get a step up in quality and reliability from something like a TWSBI 580. The real competitor at this price point would be a pen like the Lamy 2000 or the Pilot Custom Heritage 92, both of which you can find with a gold nib for less money. However, the Pelikan M205 has the option of interchangeable nibs, and features Pelikan's distinctive design. I also love the color of this blue demonstrator, and I wasn't going to miss it a second time. 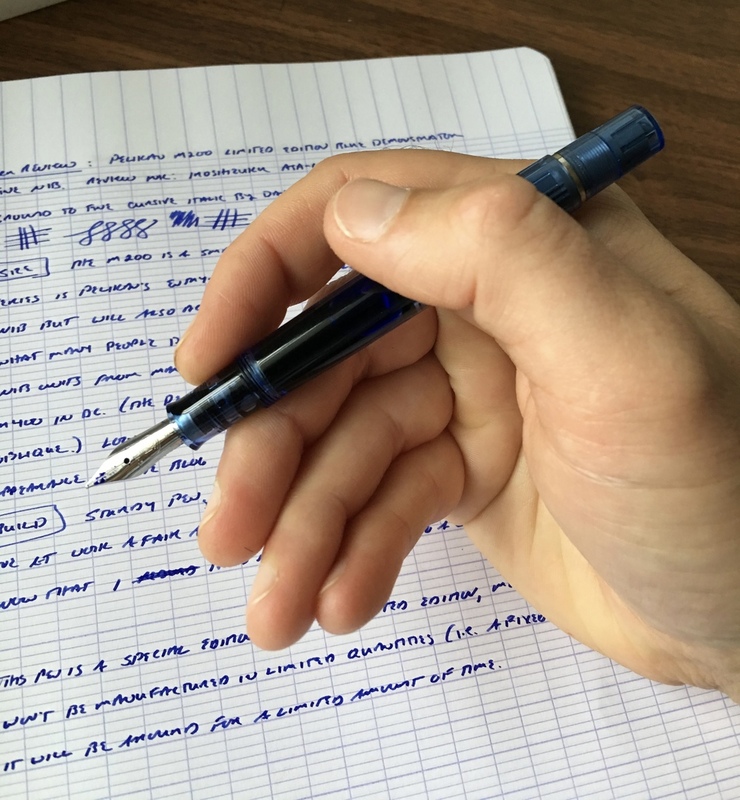 PenChalet currently has the M205 transparent blue in stock in all nib sizes (EF-B), priced at $140 before any applicable discount. Pelikan categorizes the M205 Transparent Blue as a "Special Edition", which I understand means that there won't be a fixed quantity (like a "Limited Edition"), but the pen will only be manufactured for a limited amount of time - probably a year. If the design and the color of the pen appeal to you, don't hesitate like I did five years ago. For a limited time, there is also an Amethyst Demonstrator (to match last year's Pelikan Edelstein Ink of the Year), and the upcoming Aquamarine Demonstrator. I might be adding both to my collection soon! Disclaimer: PenChalet provided me with this pen at a discount for review purposes. This post also contains affiliate links.